My fav..."I have no idea what you're talking about. So here's a bunny with a pancake on his head." Hehehe. Yeah, I'm weird like that. 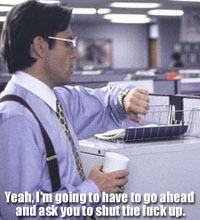 Ah, Office Space...you have no idea how often I quote that movie at work. Oh these are so funny..
Ahhhh.... just when I'm fresh out of graphic ammo from my last flame war, The Princess™ delivers! Hee hee, I love when you find these things!